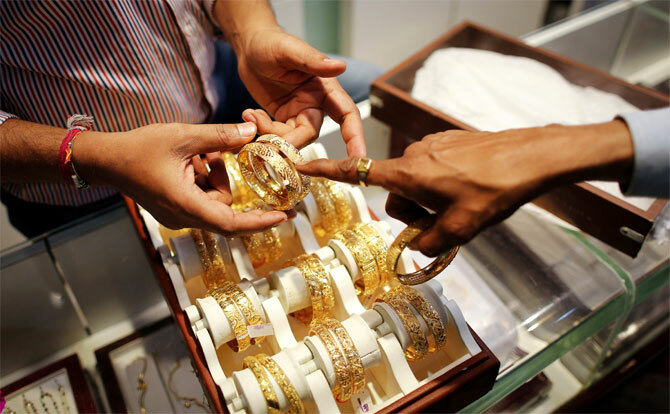 Jewelers also want import duty on gold to be reduced from the current 10 per cent to at least 5 per cent. The domestic gems and jewellery industry, which went through a lot of turmoil in 2016, has urged the government to increase the mandatory PAN card limit to Rs 500,000 and above and reduce the import duty on gold to at least 5 per cent in the Union Budget 2017-18. All India Gems and Jewellery Trade Federation (GJF), the apex body for domestic gems and jewellery industry, has recommended the finance minister to increase the mandatory PAN card limit to Rs 500,000 and above. "With the implementation of the PAN card limit of Rs 200,000, the industry has been facing serious challenges. Organised sector, which is growing by at least 2 per cent every year since past decade is directly hit due to this. We request the government to bring the PAN card limit to the earlier level of Rs 500,000 and above," GJF chairman Nitin Khandelwal told PTI. He said they should also reduce the import duty on gold from the current 10 per cent to at least 5 per cent. "The high import duty on gold bullion at 10 per cent has been adversely affecting the industry. This has built a parallel economy, leading to wide scale gold smuggling. It is also affecting domestic retail and manufacturing industry adversely. Bringing down duty to at least 5 per cent will eliminate the grey market," he added. Further, GJF has also recommended Goods and Services Tax (GST) at 1.25 per cent for the gems and jewellery sector, so that it help the industry become compliant and organised. "Soon the entire nation will come under the single taxation regime of GST. We recommend GST at 1.25 per cent for the gems and jewellery sector, as this will help the industry become compliant and organised," he said. Khandelwal also said the jewellers should be enabled sell the Ashoka Chakra Gold coins launched by the prime minister through their retail stores. "This will increase the reach and generate more sales of the coins," he said. GJF has recommended the need for the formation of domestic council for the sector to address various issues pertaining to the industry, including generation of reliable database and regulation of fair trade practices and to help the government in forming industry friendly policies for trading and manufacturing, he said. It has also recommended to keep the dore import under tight observation to avoid malpractices. The gold import presently has been confined to banks and nominated agencies, however, over time more and more agencies should be given opportunity to be enlisted to allow good competition and easy availability of gold across the country, Khandelwal opined. Further, welcoming the government's decision of mandatory Hallmarking, he said, there is a need for new and upgradated Hallmarking centres across the country. "This is an important aspect to consider, since increasing the number of hallmarking centres with proper implementation of the Hallmarking process for gold will streamline the industry," he added. GJF is an apex and responsible body for the domestic gems and jewellery industry representing over 300,000 players comprising manufacturers, wholesalers, retailers, distributors, laboratories, gemologists, designers and allied services to the industry.